Seed starting isn’t the worst thing to do in the winter, but having your May seedlings sprouting in February is definitely not a good idea. It all started with last year’s massive seed starting failure. As usual I filled a few dozen pots and set them out in the cold to wait for spring, but the results were far from good, and only a few things sprouted. I thought it might be the weather, but now I’m leaning more towards a bad batch of soil. 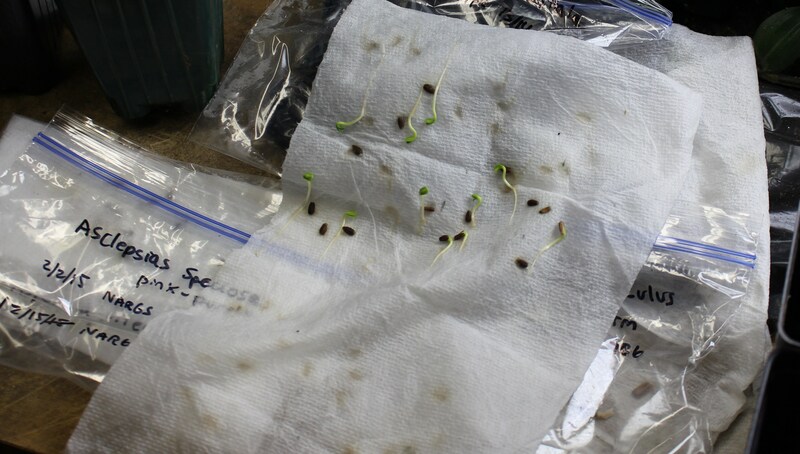 So this year for a bunch of seeds I figured I’d skip the soil and go back to the Deno method (click here to see how that works) of sprouting seeds in plastic bags. I set up a bunch of seeds which I thought would benefit from a nice bit of cold before sprouting, but also thought it might be a good idea to give them a week or so of warmth first. You can guess what happened. Just five days later and I have a mess of sprouting seeds to deal with. After having failed twice already with these Californian thistle seeds it looks like they didn’t need a cold treatment after all! So now I’m faced with a bunch of seedlings which will somehow have to survive my care under lights for at least 2 more months. Even with the cool temperatures out in the winter garden slowing down their growth it will still be a long haul. Another not so smart thing was finding a baggie of needle palm seeds which I must have given up on two years ago. Apparently there was a (now brittle and cracked) outer shell which I didn’t know about and which probably should have been removed prior to sowing. It will be a true testament to the lives of seeds if these go ahead and sprout now. I’m much more optimistic about seeds I received from this year’s HPS seed exchange. 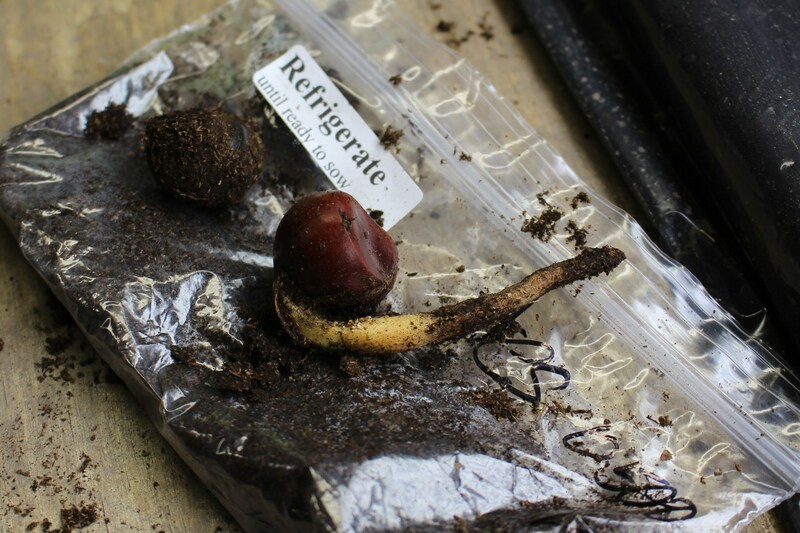 I potted up this happily sprouting red buckeye (aesculus pavia) seed yesterday and will try and find a cool spot for it until things warm up outside. Also arriving pre-sprouted are two packets filled with Southern Magnolia (m. grandiflora) seeds…. don’t ask about that, I don’t need one borderline hardy southern magnolia let alone two dozen, but I should have plenty of time to think that one over since I’m hoping they’ll be slow growing. The rest of my seed exploits should also be in better shape. I did go traditional and put out two trays of little pots to suffer through the rest of winter under the deck, and they will hopefully not run into problems this year, but the rest of my perennial seeds went into baggies and are sitting in a box in the fridge. It all feels pretty promising to me. Even the ones that had already sprouted in their baggies are coming along nicely after a few days under the growlights. Carefully planted into soil the little seedlings greened up and sprouted normally. I’m pretty sure I’m the only person in my end of Pennsylvania who has half-hardy Californian cobweb thistles (cirsium occidentale) growing along indoors under lights. That must mean something, I’m not sure what. The first yellow primula polyanthus in full bloom. A little sparse, but still perfect….. and the cyclamen aren’t too shabby either! Never fear, I also have a few onions sprouting so not everything is odd and nearly useless flowers…. but I also have to warn you there are two more primrose divisions on the cool windowsill which are only now starting to put up buds. If the weather keeps going as cold as it is you might be stuck looking at them all through March! 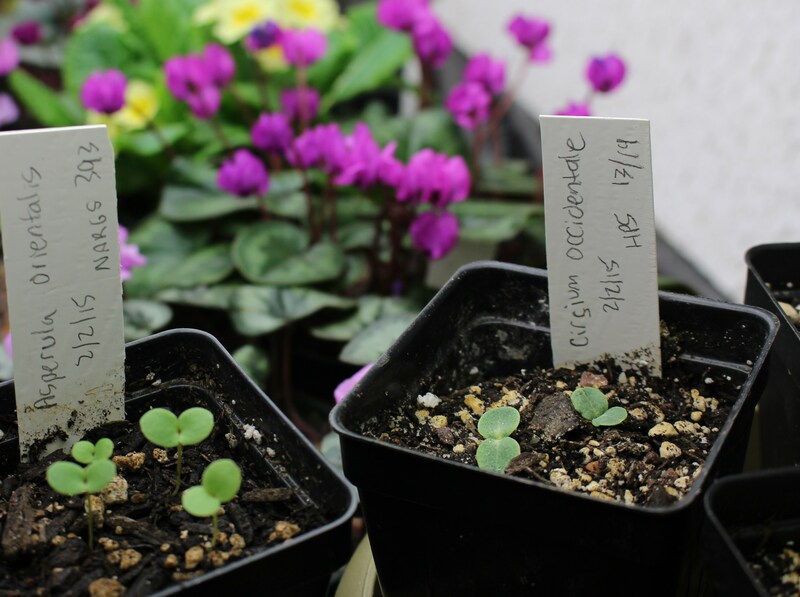 This entry was posted in growing under lights, late winter, perennials, seeds, that wasn't smart and tagged deno method, garden, growing from seed, growing under lights, moist packed seed, seed starting, sprouting seeds, winter sowing. Oh, excellent! Now whenever my family casts aspersions on my sanity, I can say, “Well, at least I’m not trying to grow Californian cobweb thistles!” I admire your foolhardy ambition. Somewhere in my own seed-starting adventures I decided caring for seedlings was too much work. Maybe one day I will take it up again. I’ve found that lowering my standards goes a long way when it comes to my seed starting, and if it all goes south you can always use them as compost feed! I would say 50% of what I start ends up being well cared for, the rest is never spoken of again. Helps keep the stress out and keeps the fun in the hobby. Hi Rita, thanks for the comment, it means a lot to me to hear that, I’m always on the fence as to whether or not anyone else is interested in my babbling and usually ill-fated garden projects, or if it’s just me entertaining myself (it is fun, I hope you enjoy it too). The primroses were outside to begin with and I brought them in before the ground froze to see if they’d grow and bloom under the shoplight I have set up. They did! I’ll plant them back outside once things warm up again. I think they would do fine for you, they’re very hardy so it’s more likely you’ll have trouble with the long hot summers. I’ve killed a couple off outside when things got too hot for them. … but just thinking of all the other heat lovers you could grow makes me a little jealous, I’m sure you’ll find something as good or better! I won’t mind looking at primroses all through March, since mine are far from flowering outdoors yet. You really are the optimist with your seedlings and I do hope they all do well for you. I can only admire your optimism since I am far from thinking about sowing seeds yet! I shouldn’t worry too much about having the seeds germinating now. Most germinate quickly and then slow right down and take ages to get to the next pricking out stage. Some seeds that germinated in January look almost the same now! I’m hoping their roots are making good growth under the surface of the soil. 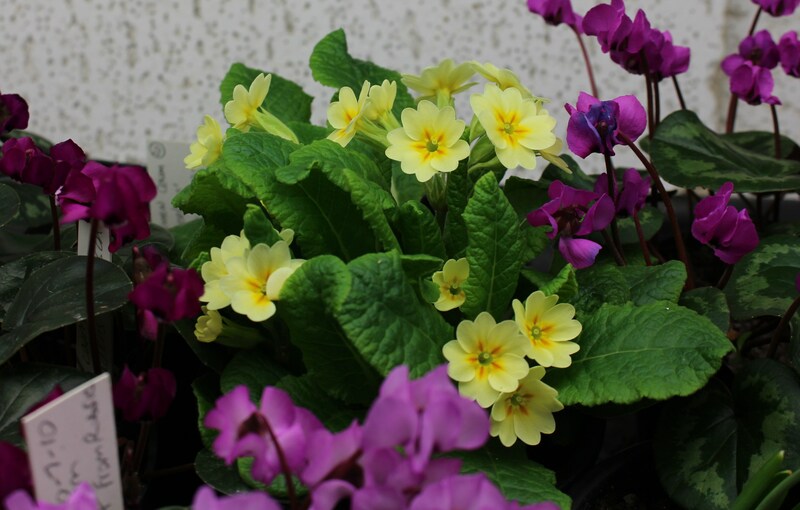 Bring on as many primroses as you like, the are lovely and cheerful with their saturated colour. You’re right of course. I’ve noticed that once they went out in the garage things have slowed down considerably. Good thing too, I’m not ready to evict the primrose and cyclamen in favor of all those needy seedlings! I’m surprised the roots handled the transplanting as well as they did. They looked so frail but haven’t skipped a beat since. 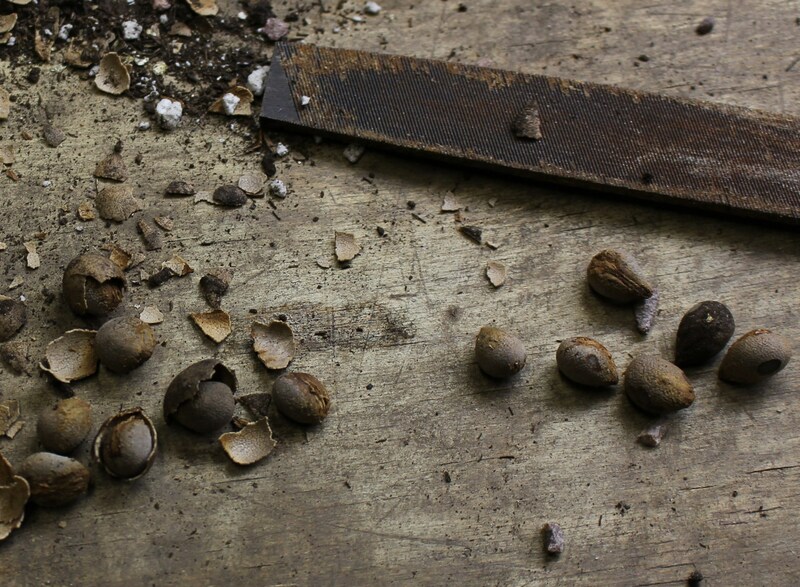 Seed sowing brings me both more anguish and more euphoria than any other facet of gardening. I sometimes wonder why I bother but it seems to be a compulsion. It clearly is for you too. I love your primroses and Cyclamen which are still looking so good. Sometimes the guilt of looking at a tray of long past transplanting stage seedlings makes me wonder what I was thinking, but then other times when something special surprises you with a bloom it’s all worth it again! -and it’s amazing what can become of those little bits of chaff and dust. I always feel I should sow seeds inside but never do. I’ll just sit on the sidelines and watch the adventures of others. Do you buy seeds and then never sow them? I used to follow that path and was never sure exactly what I was up to! I have a stack of seed packets sitting forlornly on the back porch. This spring, though, I really intend to sow at least some of them. Hah, funny you should mention that. I had a wonderful collection of lettuces last year. Didn’t eat a bit of it but it was just so nice to have all those healthy looking greens. Tomatoes too. Working with them and breathing in that smell is a perfect way to spend indoor time when it’s still cold and slushy outside. Sunday sounds like the perfect day to plant seeds, have fun! I’ve done that before, too. I agree with casa mariposa–just keep pinching them back and they should be fine. Pinch I will! Maybe it will be an early spring and they’ll all be ready to go out just on time. Oh you will definitely have more primroses in your future!! Seeds are on their way! Your Cyclamen are lovely and together with the polyanthus yellow they are sight for color starved eyes! 🙂 The APS is living up to its mission to encourage the growing of primulas, and I might just have acquired a little case of primrose fever! A new growlight was purchased last weekend, and I’m ready for just a few more seeds. This is going to be fun, thanks! I have done that too in my exuberance to rush the season into spring starting seeds. Some need an earlier start, but like you mentioned, it takes work to get them thriving under grow lights for months. They are always weak in the stem by the time to plant. Hardening them off before going outside for planting only helps a bit, the stems are still spindly. I think the coolness of my room helps keep them sturdy, that and the four bulbs as opposed to just two. If I wasn’t so greedy for the space I bet I could even grow a decent crop of lettuce down there!